He once broke thru the first jump at a tournament in Ramona, breaking the board completely in half while in a heat. Nobody has ever seen this to my knowledge. He was not injured and kept racing! He won’t stop at anything when he is at his job. I have also caught him doing an “opponent check” at the box in photos. He loves any toys with squeakers in them and will just squeak them until I take it away. He has some funny antics like lying on his back with a squeaker toy or putting them in a water bowl to create different sounds or pick up a plastic pot and push it and flip it and through it in the air. He loves to cool himself down in the kiddy pool or splash in his water dish during and after working/playing! This boy is very special! 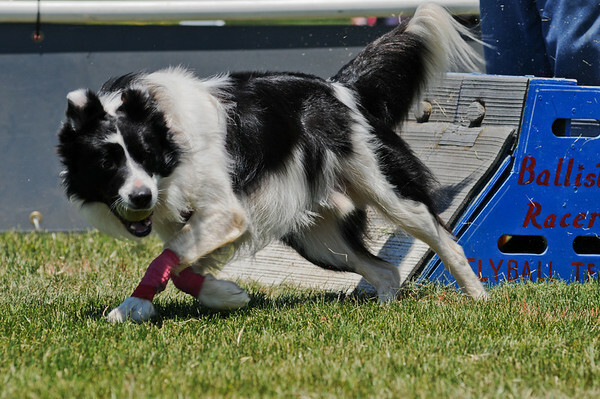 Riv has been an amazing bullet of speed to watch on the flyball course. High drive and motivation is his trademark.